Hats off to the Burtmeister, then, that Sleepy Hollow remains constantly entertaining, never descending into the realm of the formulaic in plot or script. The story, set in the 1700s and based on Washington Irving’s short story, tells of Ichabod Crane, a progressive police officer sent to investigate a series of grisly beheadings in the small and superstitious town of the title. The locals blame the Headless Horseman, the vicious ghost of a bloodthirsty Hessian, and the cynical Crane gets a nasty shock when he discovers that the locals may be right. A ripping good gothic tale ensues, full of ghosts, holy ground, witchcraft of both the black and the white variety, religious fanaticism, torture chambers and breathtaking special effects. 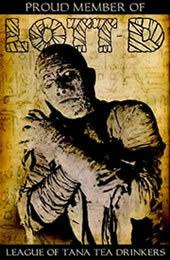 Visually, the film is a feast of Burton trademarks. Expect pumpkins galore, pinstripes aplenty, an oversized Moon and a healthy dose of the elegantly decanted red red vino. Yes, this film has its share of gore, but it’s so stylishly done you’ll want it on your mantlepiece. The attention to detail is marvellous, from the child’s Halloween light projector that casts comforting shadows of witches and ghouls on his wall to the Baroness’s cobweb dress, a near-copy of that worn by the cruel sorceress Sidonia von Bork in Edward Burne-Jones’s painting of the same name. Yet, as one would expect from a Tim Burton film, the grand set pieces really make the movie. Some notable examples include a torture chamber so pleasingly decorated in black, white, silver and (blood) red that it’s almost beautiful and an imposing bridge whose acoustic tricks and sheer scale make it deliciously creepy. The star set piece, though, has got to be the Tree of Death. In shape it resembles the living trees in The Wizard of Oz, which makes it sinister enough in my book, but it goes a little further than throwing apples. Danny Elfman provides yet another unsettlingly familiar orchestral score, reminding us yet again that there can be such a thing as a perfect couple. Elfman’s name has long been synonymous with Burton’s movies, and for good reason. His were the mournful violins and angelic chants of Edward Scissorhands and the madcap musical bouncing of Beetlejuice. The score for Sleepy Hollow is altogether different. Edward may be called horror-fantasy, and Beetlejuice horror-comedy. Sleepy Hollow, however, is pure horror, and the score knows this. Don’t expect to drift to sleep or get up and dance, but do expect a soundtrack that is evocative, dramatic and always interesting. Another near-perfect couple are Johnny Depp’s Ichabod Crane and Christina Ricci’s Katrina Van Tassel. Depp, now a Burton movie regular (having starred in both Edward Scissorhands and Ed Wood), has the necessary exaggerated theatrical acting-style down to such a fine art that we can almost forgive the bizarrely well-travelled accent (still, even that’s better than his cheeky Australian cockney in From Hell). Ricci is not at her most memorable, but looks stunning as the film’s wide-eyed, innocently bewitching heroine. Christopher Lee’s presence, although very welcome, does rather point to the unseen neon sign reading ‘my other token horror veteran is Vincent Price,’ but under the circumstances… well… we’ll allow it. 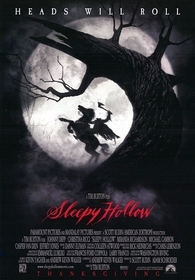 Sleepy Hollow is a must for Burton fans; it's gorgeously made, evenly-paced and pretty darn scary. However, if you hate Burton’s films or don’t enjoy seeing raging stallions with flared nostrils and headless riders emerging from Hell via a tree full of human heads (and it takes all sorts), best to leave the lights on and watch Never Been Kissed again. Submitted by Robert Butz (not verified) on Sun, 2009-07-26 23:44. I believe that the dungeon scene in which belonged to Depp's father in the movie represents that of the one from Edgar Allen Poe/ Roger Corman film 'The Pit and the Pendulum' (1961). Not only is this one of Vincent Price's memorable films, but it displays his mother being locked up inside one of the torture divices, much like Depps mother he sees in his dreams/flashbacks from his past. Tim Burton is known to have been influences by Brittish Hammer Films and by horror stars such as Vincent Price and Peter Cushing.